What if neighbouring areas are very different? Waldo Tobler’s first law of geography is that “everything is related to everything else, but near things are more related than distant things.” This is an important idea for many aspects of spatial science, but it’s taken particularly seriously by people who draw maps and do statistics to investigate how and why disease rates vary from place to place. If Tobler’s first law holds, we should expect the characteristics of people and places who are close together (including their health) to be similar. So, in general, the folk who live in your neighbourhood should be more like you than the folk who live on the other side of town. This matters when we are researching if and how environment affects health. We know that people’s health can be affected by a huge range of things. If we are to reveal the health impacts that environment has, we need to try and allow for as many of those other influences as possible. However, we know that it’s very hard to account for all of them. This means some of the relationship between environment and health we see in our analyses may actually be due to these ‘unmeasured’ influences, a problem we call ‘residual confounding’. Now, if Tobler’s law is right, it is also likely that these unmeasured influences are also more similar when they are closer together. When this happens, it’s called residual spatial confounding. If we don’t allow for it, we run the risk of making mistakes in assessing the strength of relationships between the characteristics of environments and the health of the people who live there. The good news is that these problems have long been known about and there are a range of techniques to try and deal with them. They include ways to statistically ‘smooth’ maps showing how risk of a disease varies from area to area, and to adjust measurements of risk for how close together they are in geographic space. The bad news is that Tobler’s first law is not always true! It’s not always the case that neighbouring areas do have similar characteristics or environments. Often areas that are right next to each other contain very different types of people and have a very different environment. You have probably experienced this when walking around a town or city. You cross a road, the housing changes dramatically, and the streets ‘feel’ different. Those statistical techniques assume that kind of sudden change doesn’t happen. Dr Duncan Lee and Prof Rich Mitchell have just finished an ESRC funded research project (RES-000-22-4256) trying to improve the way we handle this situation in our research. We have successfully created, and published techniques that can spot when two neighbourhood areas are so different that we need to alter our statistical assessment of the relationships between health and environment. One technique, published in Biostatistics, can be used when we have data that tell us something about the characteristics of the people or the neighbourhoods, such as house prices or smoking rates. The other can be used when all we have is information about health in the areas (now in press with Journal of the Royal Statistical Society Series C) . Here’s an example of our results. The map below (click it to view full size) shows 271 areas that make up the Greater Glasgow and Clyde Health Board (for the geeks, the areas are intermediate geography zones). We obtained data on the risk of admission to hospital with a primary diagnosis of respiratory disease, from the Scottish Neighbourhood Statistics database (http://www.sns.gov.uk/). The map is shaded so the colour of each area denotes its disease risk, with a value of 1.0 representing an average risk across the whole health board. Values above 1.0 represent high risk areas (for example a value of 1.10 indicates a 10% higher risk), while values below 1.0 represent low risk areas (for example a value of 0.85 indicates a 15% reduced risk). The red lines show boundaries between neighbouring areas that contain populations at very different risk of hospital admission for respiratory disease. These are the areas in which the conventional techniques would make mistakes. There are 173 of them… that’s 25% of all the boundaries in the map. Data and boundaries © Crown Copyright. All rights reserved 2010. We have created a free software package that will allow anyone to apply our techniques. It’s called CARBayes and is for the statistical software R. You can read about it and get it from here. There has also been an interesting spin off from this research. Within Glasgow, we found a lot of neighbourhoods that were right next to each other but were very different in social and economic terms. We called these between-neighbourhood differences ‘social cliffs’. It prompted us to ask how such social cliffs occur. 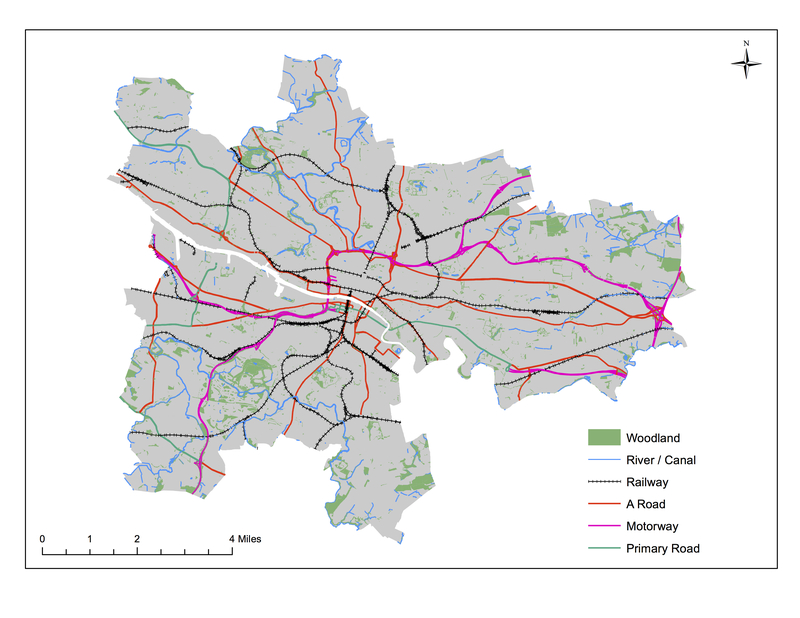 One idea is that they may be made more likely by physical barriers between the neighbourhoods, such as rivers, main roads or railways.The map below (click it to view full size) shows the kinds of physical features we’ve been looking at (note, our data are for the period before the new M74 motorway was opened). Map based on data that are © Crown Copyright/database right 2012. An Ordnance Survey/EDINA supplied service. Our research is now complete and we’re writing it up for publication. It seems that two kinds of physical feature are especially important. Where one or both of them lie along a neighbourhood boundary, it’s much more likely that the neighbourhoods will be very different socially, and economically. Which two do you think they are? A new systematic review looking at the relationship between socio-economic position over the life course and quality of life has just been published in BMC Public Health by CRESH PhD student Claire Niedzwiedz, Rich Mitchell and colleagues at the University of Glasgow and MRC/CSO Social and Public Health Sciences Unit. The review’s aim was to gather and examine evidence about how people’s quality of life as adults depends on the social and economic circumstances they have experienced throughout their life, from childhood onwards. Do childhood circumstances matter? Does it help if people move ‘up’ the socio-economic ladder? Does it harm if people move ‘down’? In chronic disease epidemiology, several conceptual models have been developed to help explore these ideas and they provide a foundation for investigating life course effects. The accumulation model hypothesises that adverse socio-economic experiences have a cumulative, dose–response effect on health. The latent model (or critical period) suggests that circumstances during childhood have an effect on health, over and above adult circumstances. Pathway models emphasise the importance of trajectories across the life course. Social mobility models are usually divided into intra-generational and inter- generational where inter-generational mobility refers to a change in social class between generations and intra-generational mobility is the movement between different social classes in adulthood. The mobility models suggest that change in your socio-economic position will affect health, and in general lead us to expect that movement ‘up’ the social ladder is good for health, but movement down may be bad. The review identified 12 relevant articles which used data from different five countries. The evidence supported an overall relationship between socio-economic position over the life course and quality of life but results for each life course model were mixed. There was some evidence to suggest a latent effect of childhood socio-economic position on later quality of life for women, but the effect was not found for men. Overall, results for social mobility models suggested little effect. We found very few studies that actually assessed inter-generational mobility or accumulation and pathway effects. There was a very wide range socio-economic position measures, outcomes, analytic techniques, reference populations and quality across all the studies we looked at. This led to a key message from the review; the need to increase study comparability. A second key message was the need for comparable data and studies from different countries. This may help to uncover aspects of different societies that influence the relationship between socio-economic position over the life course and quality of life. You can access the article here: http://dx.doi.org/10.1186/1471-2458-12-628. Stigma, environments and health inequalities: why should we be interested? In recent years there has been a great deal of interest amongst health researchers in the role of social stigma in affecting health. Social stigma can be articulated as a majority view that works to spoil the identity of others on the basis of a discriminating characteristic such as race, gender or class. The social stigma associated with some minority groups has been shown to have health salience in terms of providing an obstacle to gaining access health care, housing provision, welfare, employment and other underlying factors affecting health. Groups that have been the subjects of research include disabled, homeless and itinerant populations and this body of work has revealed the multitude of interpersonal and institutional factors linking discrimination with health. Stigma has also been adopted as a deliberate strategy in health promotion initiatives, most notably in tobacco control with recent work beginning to question whether the denormalisation and stigmatisation of smoking (and the smoker) has reached its limit as a public health goal. Given the long tradition of work on stigma and health, and the importance of stigma for establishing and perpetuating health inequalities, it is perhaps surprising that few researchers have considered the potential significance of place and the environment in establishing, perpetuating and mediating social stigma. 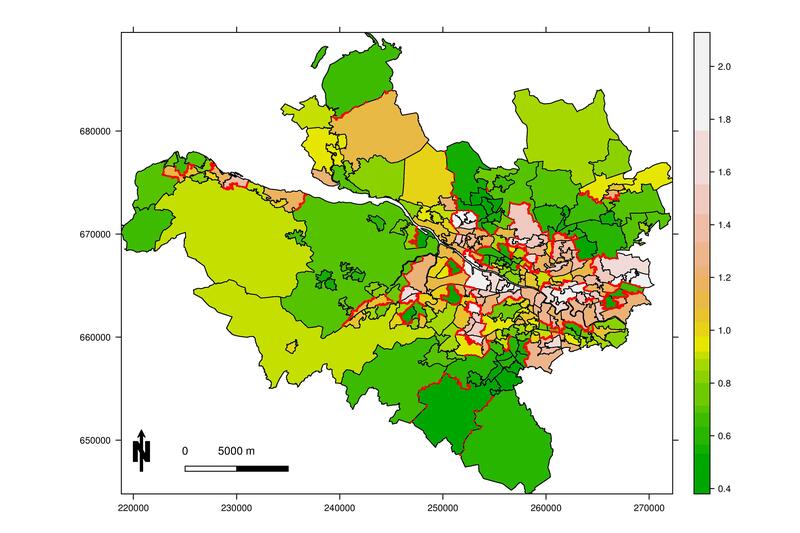 In a recent commentary* on a Japanese paper on place-based discrimination published in the journal Social Science and Medicine, I argue that geographers (and others with interests in place, space and health) could productively consider the role of spatial stigma in affecting the health of local residents. Spatial stigma arises in places with notoriety in the public discourse, and that are constructed as ‘no-go zones’ or ‘sink estates’ that require constant policing. Neighbourhoods such as Toxteth in Liverpool, South Central in Los Angeles or the French banlieues have for instance been prejudiced by deep-rooted geographical discrimination. Key to the argument in the commentary is that there are a range of consequences for population health of residing in a highly stigmatised community. Yet very few empirical studies have tested the salience of spatial stigma in affecting population health. 1. Being ‘looked down on’ because of residing in a stigmatised community can detrimentally affect a number of life chances such as education and training opportunities, employment prospects and the prospects of developing interpersonal relationships. These factors have all been implicated in studies of health. 2. Stigma relating to particular places may act as ‘badge of dishonour’ that results in local residents taking actions such as concealing their address, avoiding receiving visitors or providing excuses to others for where they live. These feelings of shame can work to spoil, manipulate and mediate individual identities and social relations and affect health (e.g. health behaviours or mental health). 3. Place-based stigma affects the levels investment and disinvestment of public and private resources put into the local community. Progressive social policy is undermined by the lack of investment in the local infrastructure, housing and other services that provide the opportunities for healthy living. 4. Social networks, community social bonds and collective efficacy are affected by residents’ withdrawal from the public realm in response to the perceived threats associated with spatial stigma (e.g. crime). The breakdown of these community ties is detrimental to physical and mental health outcomes of local populations. In short, there is plenty of evidence from the urban sociology and urban geography literature that through a variety of intersecting pathways place-based stigmatisation is harmful to the life chances of local residents. The population health consequences of place-based stigma are however less well established; understanding these pathways is an important challenge for researchers with an interest in the environment and health. This challenge is particularly important during a period of austerity with major reductions in state investment in a range of health related infrastructure. A likely consequence of this retrenchment is the heightened stigmatisation of many socially disadvantaged communities with potentially disastrous implications for public health and health inequalities. *Library access required; if you are unable to get hold of the paper then I’d be please to email you a copy (jamie.pearce@ed.ac.uk). .
A collection of papers published in a recent issue of Social Science and Medicine considered the implications of the recent crisis in the financial sector and subsequent austerity policies for population health. The conclusions were equivocal. On the one hand the direct impact of the financial crisis (e.g. unemployment) on health is clearly detrimental to the individual concerned and their immediate family. For instance, the incidence of suicide, drug abuse and domestic violence might be expected to rise. Yet at the same time economic downturns may lead to an improvement in the overall health of populations. But what explains this apparent contradiction? One possibility is that population health may be enhanced during periods of economic downturn because of a reduction in unhealthy ‘affluent behaviours’ such as the over consumption of food and alcohol or a fall in road traffic accidents. What is clear is that the longer term implications of the recent financial crisis are difficult to predict. An important omission from this discussion of the health implications of the financial crisis is a consideration of geography. This seems surprising as the health consequences of economic retrenchment are unlikely to be evenly shared across all parts of the country. In the UK for example, the financial crisis and subsequent austerity are likely to affect people living in Glasgow rather differently to folks from London. The health impacts will be most detrimental for people in the least socially advantaged places. It is feasible that in the most prosperous regions of the country, health will be unaffected…..or even enhanced. In short, geographical inequalities in health in the UK could rise substantially in response to the ‘austerity agenda’. So what are the processes linked to the deficit reduction strategies that are likely to affect geographical inequalities in health in the UK? In this CRESH blog we outline four (non-exhaustive and inter-related) reasons for why we might expect health to become geographically polarised. Perhaps most obviously, the ‘social geography’ of the UK is likely to be heavily affected by the current and forthcoming austerity strategies which in turn can be expected to undermine some key social determinants of health. Austerity measures could well widen the geographical discrepancy in social markers at various different scales, particularly between regions of the country. For example, places with a larger proportion of workers employed in the public sector will be particularly vulnerable to unemployment and job insecurity. Similarly income disparities between regions are likely to grow. Unemployment, job insecurity and income inequality are causally related to health. One response to the changing socio-economic map of the UK is likely to be heightened regional inequalities in health. Job insecurity, unemployment and changes to welfare including a cap on housing benefits are likely to ‘disrupt’ patterns of mobility and lead to new forms of migration and mobility streams that are health selective. As job markets stagnate or contract, it is feasible that migration from north to south may lessen and/or become increasingly socially selective. There is also the worrying prospect of low income (and less ‘healthy’) families being displaced from their homes by the cap on housing benefits. This policy change is likely to see a movement of low income (and less ‘healthy’) individuals away from more prosperous suburbs into more ‘affordable’ neighbourhoods, as well as the entrapment of others in less healthy places. Austerity measures are already leading to a reprioritisation of public services provided by local authorities and other organisations. Which services will continue to receive resources and where there will be disinvestment is starting to become clear. As a recent blog argues, the middle classes are skilled in resisting cuts in services and new (unwanted) developments, an advantage that may lead to further disinvestment in disadvantaged communities during periods of fiscal tightening. At the same time, the Westminster government is looking to deregulate various environmental regulations that were often implemented to protect vulnerable communities from the health effects of various types if disamenities. The re-prioritisation of investment in public services and changes to environmental legislation is likely to lead to greater environmental disparities across regions in the UK. Environments that support health and well-being may well become just as disparate, raising environmental justice concerns and negatively affecting area-level health inequalities. Much academic research and policy initiatives have been concerned with ‘place-based’ determinants of health. The premise here is that factors relating to geographical (often local) context are fundamental to understanding social and geographical differences in health outcomes and behaviours. Place-based factors such as neighbourhood social capital, local norms, access to shops and services, social networks, concentration of poverty and a whole host of other factors have been implicated. Austerity measures are likely to undermine efforts to improve local infrastructure (see above) as well as disrupt local community networks. Similarly, earlier CRESH work suggests that ‘problem’ health behaviours such as smoking, drinking and gambling may be reinforced in disadvantaged settings during tightened financial times. We would be delighted to hear your comments and suggestions. What are other mechanisms that might affect geographical inequalities in health? What are the key concerns outside the UK? CRESH are organising a conference session at the RGS-IBG and look forward to receiving abstracts. In recent years the dominant discourse in environmental justice research has been concerned with notions of distributive justice. Studies adopting this utilitarian perspective have tended to consider the socio-spatial distribution of environmental ‘goods’ and ‘bads’. A common conclusion is that low socio-economic, ethnic minority and other vulnerable groups and places are often disadvantaged in terms of the availability of environmental resources or contact with environmental burdens. More recently, environmental justice scholars have challenged the dominance of the distributional approach. They have called for a reorientation that includes a consideration of (i) the processes underlying the maldistribution of resources and (ii) how the distribution of resources affects health and well-being. To date, despite its obvious potential, there has been little geographical work at the intersection of the fields of environmental justice and health inequalities. The aim of this session is to bring together papers from an interdisciplinary group of researchers concerned with issues of environmental justice and health. This session, organised by the Centre for Research on Environment Society and Health (CRESH), seeks papers which address the following non exhaustive list of possible topics including climate change, health behaviours, salutogenic environments and vulnerability. Deadline for submitting abstracts is Friday 2nd of December. CRESH and colleagues from the Universities of Liverpool and Portsmouth have launched a film about their plans to measure the progress of Big Society across the UK. See it at measuringbigsociety.org and find out more about the project here. the methods we propose to use to develop the measure. Please download the document here and comment by Friday April 22nd. Many thanks for your involvement.